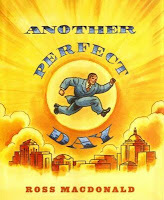 So it's time for Another Perfect Day, a day where everything goes exactly as you'd want it. What does it include? A human rocket launch? Alligator tickling? Piloting your personal, open cockpit jet on your commute from the circus to your job as Chief Flavor Tester at the ice cream factory? Saving the world from alien invasion? Yeah, me too. And Jack. Jack's got a Clark Kent look to him, but I think he's a bit more wholesome. Up with the sun, impeccably dressed, always willing to help...he's living the dream. Literally. But perfect days don't last. What's this? A tutu? A baby rattle? Clown shoes, tricycle, and baby bonnet? "But I don't get it!" Jack exclaims. "Why are all these terrible things happening? What happened to my perfect day?" Thanks to the advice of a young man who made his first appearance when Jack BASHed a monster robot that morning, Jack is able to straighten things out and end his nightmare day. All it takes is sunshine, birds singing, and some toast. 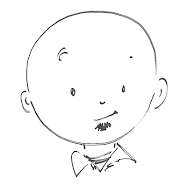 Great picture books contain illustrations that reveal more each time the book is opened. Look carefully at Jack's pajamas. Look familiar? When Jack's Perfect/Nightmare Day ends, all of his daily adventures make a second appearance, just in a bit different context. Reading the story the first time is hilarious. What's not to like about Jack getting his exercise by tickling an alligator, saying, "Gitchee! Gitchee!"? Taking the time to look carefully at the illustrations a second (third, fourth, fifth...) time makes the story all the more enjoyable.